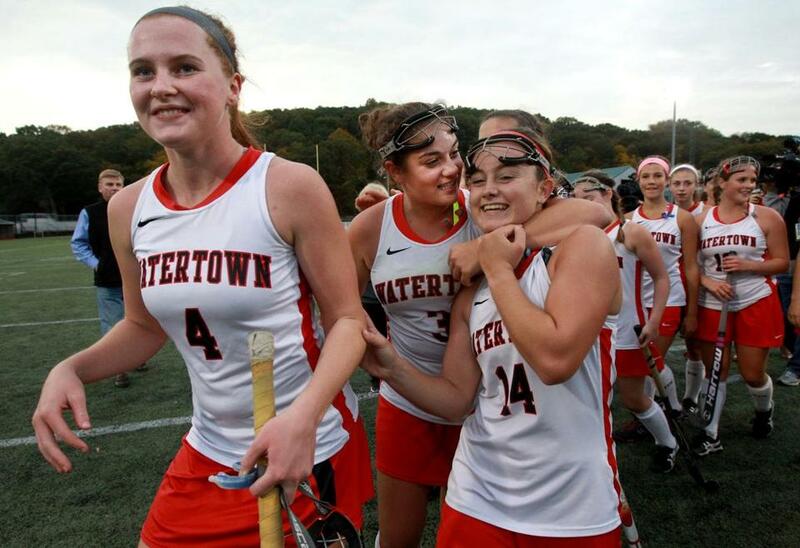 Watertown won another state title and extended its unbeaten streak to 160 games. Barrett was the backbone of the undefeated Division 1 state champions. She totaled 22 goals and 19 assists and finished her career with 50 goals and 48 assists. A four-year varsity starter, she will play field hockey at Northeastern. The Middlesex League MVP helped Watertown win another state title and run its undefeated streak to 160 games. The junior has 69 goals and 66 assists in her career and has been a Middlesex League All-Star three times. 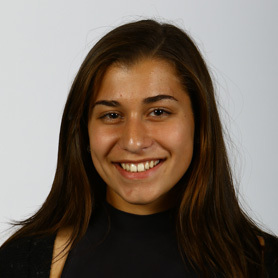 Braceras was among the leading scorers in the state, potting 30 goals and adding 12 assists. Her efforts earned her Dual County League All-Star honors and a spot in the Best of 60 game. She will play field hockey at Dartmouth. Brinkhaus earned Bay State Conference MVP honors for the second time. 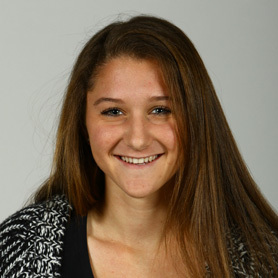 She scored 24 goals and added 23 assists, helping Needham to the Bay State title and a 21-1-2 season. She finished her career with 78 goals and 43 assists. Conley helped lead Dennis-Yarmouth to the state tournament, earned Atlantic Coast League All-Star honors for the second time, and earned a spot in the Best of 60 All-Star game. She is also an ACL softball all-star. 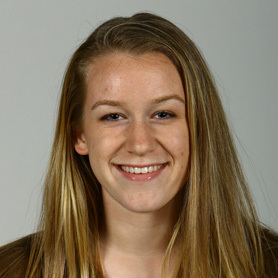 Connolly earned Hockomock League MVP honors, helping Stoughton make a state tournament appearance. 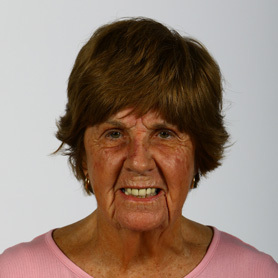 She is also a Bay State Games participant. She has committed to Northeastern for field hockey. 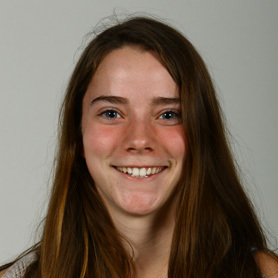 The MVP of the Middlesex Liberty League, Habelow scored 22 goals and added 11 assists, running her career total to 83 points through three years. 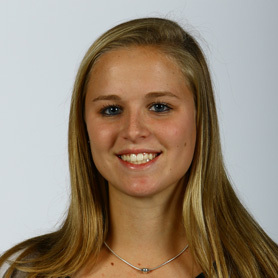 She also plays lacrosse and has committed to play field hockey at Louisville. 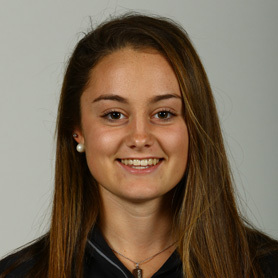 Hughes earned Merrimack Valley Conference MVP honors, scoring 13 goals and adding 24 assists. She helped the Golden Warriors to the Division 1 North sectional final. She also plays hockey and runs track at Andover. Kearney missed half the season due to injury but still managed to score 26 goals, including the game-winner in the Division 1 state final as well as a hat trick in the state semifinals. She has 42 career goals. 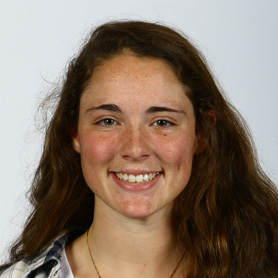 Leahy led the Skippers in scoring for the third straight year, tallying 23 goals and 21 assists as Cohasset won the South Shore League title and earned a sectional final berth. An honor student, she also plays lacrosse and ice hockey. McCall never lost a game in her career at Watertown and was a Middlesex League All-Star the last three years. She finished her career with 29 goals and 21 assists. 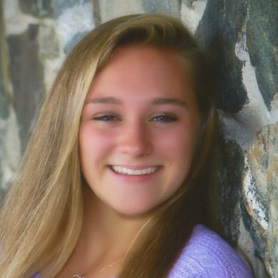 McCall is committed to play field hockey at Vermont. 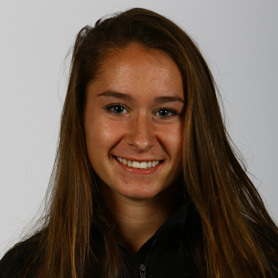 McCarthy earned Northeastern Conference Player of the Year honors, netting 11 goals and 19 assists on the season. She was named to the Best of 60 All-Star game. 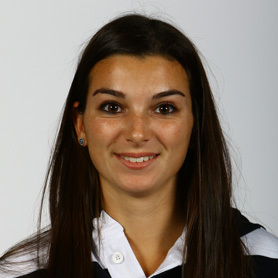 She also plays ice hockey and lacrosse at Danvers. 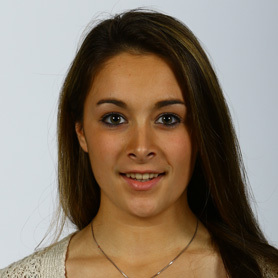 Souke helped Sandwich to a 14-2-2 record and a Division 1 South semifinal berth while scoring 15 goals and nine assists. 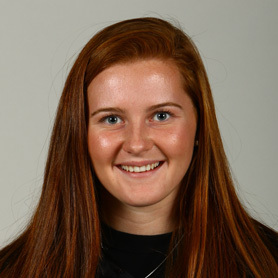 The Atlantic Coast League All-Star is a Bay State Games participant and also plays ice hockey and lacrosse. Taylor helped lead Hanover to the Division 2 South sectional title, netting 27 goals and 15 assists while earning Patriot (Fisher) League MVP honors for the second time. She finished her career with 62 goals and 30 assists. Todesco helped lead Mansfield to a second straight Hockomock League title and a Division 1 South final appearance. She was a league all-star and a Best of 60 game participant. She also plays lacrosse. Weber helped carry Walpole to the Division 1 South sectional title, scoring 13 goals and 17 assists while earning Bay State Herget MVP honors. A high honor student, she also plays basketball and lacrosse. 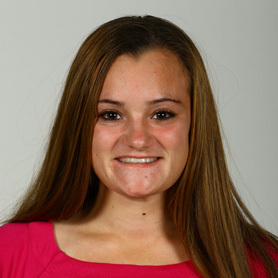 Wrightington earned South Shore League MVP honors while potting 32 goals and adding 17 assists for Monomoy. The forward has been a four-year starter and a three-time SSL All-Star. She also plays ice hockey. Shoemaker guided the Colonials to a 23-0 season and their second straight Division 1 state championship. It was her fifth state title in a career that includes a 248-22-21 record. She’s also run 25 straight Boston Marathons. In her 52d year, Schneider led Hanover to a 19-1-3 record and the Division 2 South sectional title. 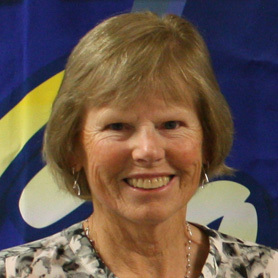 The Indians captured the Patriot League crown and helped Schneider win her 500th game. Her career record is 510-187-120. Atlantic Coast — Dennis-Yarmouth: Taylor Conley, Anna McGaffigan, Sarah McGaffigan, Julia Paini, Summer Walsh. Falmouth: Emma Callahan, Hannah Callahan, Ericka Meissner. Marshfield: Julia Kolar. Nauset: Mackenzie Meads, Emma Stevens. Sandwich: Sarah Condon, Anna Hurley, Carly Powell, Samantha Souke, Carly Whittle. Bay State — Braintree: Deirdre Burchill. Brookline: Emma Ewas. Dedham: Tori DeBerardinis, Caroline Mitchell. Framingham: Bailey Horne, Kate Kelly. Milton: Kate Driscoll, Anne Malloy. Natick: Abby Verdelli. Needham: Allinson Brinkhaus, Kailey Conry, Ally Hickey, Kendall Milligan. Newton North: Rachel Hamilton, Amanda Smith. Norwood: Hannah Benson, Nichole Hayes, Maura O’Neill. Walpole: Sophia Giovaniello, Sarah Rockwood, Celia Walsh, Melanie Weber. Wellesley: Danielle Hickman, Sophie Vernon. Weymouth: Alivia Hearon. Big Three — Brockton: Leah Burke, Angelina DeAndrade, Maddie Marchand, Jessica O’Neill. Durfee: Katelyn Banalewicz, Mikell DaSilva, Laura Gaudette, Hailey Michels, Brittany Tabicas. New Bedford: Rylie Indio, Niaye Livramento, Erin Rezendes, Katelyn Santos, Lugan St. Louis. Cape & Islands — Nantucket: Callaghan Bartlett, Farrell Duce, Darcy Foulkes, Sinead Yelle. Sturgis East: Ashley Fligg, Toni Powicki, Kate Smith. Sturgis West: Daniel Burke, Alexis Hartnett, Curtis Merritt, Greta Nelson, Kit Palmer. Cape Ann — Amesbury: Abbie Sartori. 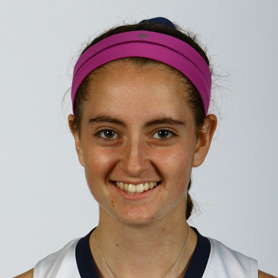 Georgetown: Molly Jannell. 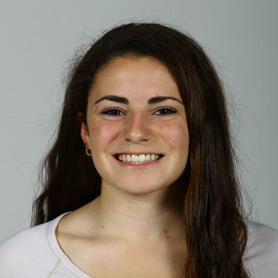 Hamilton-Wenham: McKenzie Plante. Ipswich: Julia Glavin. Lynnfield: Lilli Patterson. Manchester Essex: Robert Carter, Charlotte Freed. Masconomet: Hannah Blake, Tessa Ives, Katherine McVey. Newburyport: Meagan Bragole. North Reading: Julia McDonald. Rockport: Miranda Roller, Heidi Warde. Triton: Samantha Brown, Emma McGonagle, Erin Savage. Dual County — Acton-Boxborough: Meg Barrett, Megan Barrett, Emma Bartle, Colleen Francis, Emma Kearney. Bedford: Sara Milano. Concord-Carlisle: Carmen Braceras, Charisse Stakudis. Lincoln-Sudbury: Carly Gordenstein, Tara Hulen, Caroline Kenney. Newton South: Lily Clemente, Madison Holland, Sabrina Stack. Waltham: Caroline Gude, Jessica Salvo. Wayland: Emily Barnard, Kylie Ham, Fiona Hart, Grace Hart. Westford: Olivia Antonelli, Kelsey Gulla, Alayna Serpa. Weston: Kylie Burkus, Natalie Casey, Caroline Donahue. Eastern Athletic — Bishop Stang: Bailee Clements, Cloe Hughes, Jacquelyn Legendre, Megan Pereira, Kateq Sheerin. Martha’s Vineyard: Julia Bettencourt, Emma Caron, Belle Dinning, Lee Hayman. Somerset Berkley: Caitlin Murphy, Christine Nasiff, Olivia Rezendes. West Bridgewater: Ashley Congdon, Courtney Troupiano. Westport: Casandra Abgrab. Greater Boston — Everett: Alexia Bartolomeo, Lindsey Burns, Emma Covelle, Kira Goodwin, Brianna Gutierrez, Talia Riccioli. Malden: Bianca Alves, Khanh Thy Dang, Haley Hoffman, Katherine Howe. Hockomock — Attleboro: Quincy Harding, Grace Mayer. Canton: Mary Nee, Lindsey Nolte. Foxborough: Meredith Cronin, Lily Daley, Sydney Garrabant. Franklin: Samantha Jones, Kenzie Pleshaw, Taylor Reutlinger, Annie Walsh. King Philip: Casie Curtin, Courtney Foley, Mary O’Connor. Mansfield: Caroline Maher, Amalia Todesco, Julia Todesco, Caitlin Whitman. Milford: Jessica Palmer. North Attleborough: Mycala Moody. Oliver Ames: Hannah Friend, Cassie Gavin. Sharon: Brigid Loftus. Stoughton: Angela Connolly, Jessica Greer. Taunton: Jordan Wade. Merrimack Valley — Andover: Caroline Curtain, Jillian Hughes, Brenna Keefe, Tori Roche. Central Catholic: Mary Lambert, Serena Rousseau, Casey Thompson. Chelmsford: Isabelle Danahy, Rachel Hopkins, Julia Squeri. Dracut: Jen Gomes. Haverhill: Alexandra Comeau, Tamara Hoar. Lawrence: Laura Zavrl. Lowell: Karl St. Phard, Olivia Trull. Methuen: Catrina Crowe. North Andover: Lexi Davidson, Danielle Jillson, Emma Johns, Danielle McAdam. Tewksbury: Megan Donahue. Middlesex (Freedom) — Burlington: Caroline Morison, Ally Roseberg, Cassidy Smith. Melrose: Emily Donovan, Yvane Ngassa. Stoneham: Allie Beauclair. Wakefield: Julianne Bourque, Jillian Cataldo. Watertown: Michaela Antonellis, Jonna Kennedy, Kourtney Kennedy, Christa Knell, Ally McCall, Mikayla Paone. Wilmington: Jackie Fraser, Melissa McNamara, Jill Miele, Bridget Sullivan. Middlesex (Liberty) — Arlington: McKenzie Steuve. Belmont: Julia Chase, AnnMarie Habelow, Kerri Lynch, Serena Nally. Lexington: Alexandra Aquilina-Piscitello, Enily DeVine, Rebecca Xu. Reading: Grace Godwin, Julia Hand, Julia Sullivan. Winchester: Carla DiBiase, Madison Micciche, Eleanor Sharon, Melissa Zavez. Woburn: Julie Doherty, Michelle Miller. Northeastern — Beverly: Gabby Cerro, Callie Donovan. Danvers: Kristen McCarthy, Anna O’Neill, Annie Tarricone. Gloucester: Rachel Alexander, Kate Morrissey. Marblehead: Kaitlyn Bernato, Hadley Woodfin. Peabody: Mallory LeBlanc. Revere: Adanna Hector. Saugus: Caity Sheehan. Swampscott: Christina King, Katie Papele. Old Colony — Barnstable: Beatriz Da Silva, Nia Eddy-Pina, Amanda Piknick, Caroline Spalt. Bridgewater-Raynham: Hailey Colon, Ali Daisy, Allyson Murphy, Melanie Newberg, Kelly Page, Katrina Perry. Dartmouth: Lyndsey Getchell, Jessica Lacombe. Patriot — Duxbury: Payton Donato, Nicole Quinlan, Keely Smith, Seton Swiderski. Hanover: Molly Cameron, Jess Gardiner, Brielle Prouty, Jen Rosinski, Chachie Smigliani, Samantha Taylor. Hingham: Casey Cosgrove, Cate Diamond, Bridget Hoffses, Ally Notarangelo, Katherine Riddell, Alissa Sullivan. Middleborough: Hayden Bagnell-Pettine. Pembroke: MacKenzie McDonald, Ally Suprenant, Katie Suprenant. Plymouth North: Arianna Brenis, Sophie Kroeze, Jacky Sullivan. Plymouth South: Hannah Bailey, Isabel Baldrate, Shannon Colbert, Caroline Loranger. Scituate: Teenie MacCune, Maeve Murphy, Maddie Ryan. Silver Lake: Anna Battista, Lexi Kupic, Abby Royle. 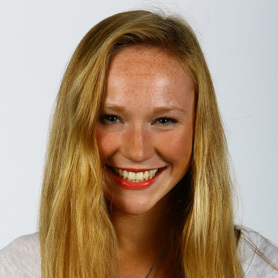 Whitman-Hanson: Kristina Woodward. South Coast— Apponequet: Caitlin Baril, Hannah Chapman. Bourne: Annie Cheney, Carly LaCasse. Case: Hannah Santos. Dighton-Rehoboth: Ashleigh Botelho, Kasey Charette, Erin Kelley. Fairhaven: Brooke Douglass. Old Rochester: Madison Barber, Jane Kassabian. Seekonk: Abbie Hopkins, Alyssa Poland, Jenna Smith. Wareham: Ruth Gonzalez. South Shore — Carver: Avery Carrara, Mackenzie Gray, Kate Rodrigue. Cohasset: Molly Cunning, Ally Leahy, Caelin McDonald, Bennett Tierney, Mimi Waters. East Bridgewater: Katz Czarniak, Kayla Nilson. Hull: Cara O’Keefe. Mashpee: Chayna Hendricks, Cece Piermattei. Monomoy: Hannah Potter, Marianna Small, Carly Tolley, Brooke Wrightington. Norwell: Sarah McGowan. Tri-Valley — Ashland: Sam Leoone. Bellingham: Blake Silvestri. Dover-Sherborn: Tara Raftery, Maddie Shue. Holliston: Cat Berg, Megan Burke, Caroline Werner. Hopkinton: Maggie Dolan, Beth Koeller. Medfield: Marykate McNeil. Medway: Kailyn Lapham. Westwood: Kaity Healey. 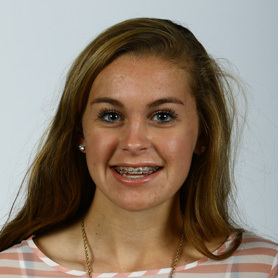 The All-Scholastic field hockey team was selected by the school sports staff. Selection is limited to MIAA schools that compete in EMass leagues. Text by Nick French.